I've been trying to make lots of different soups for Mr. Dragon. I'll try to remember to post the recipes for you -- only if they are good! We are trying to stick to mostly vegetarian eating while we wait for surgery. Build him up! Here's the lentil soup recipe I used, with my notes. You know I never make anything exactly as the recipe is written! I hope you enjoy. 1. Cook onions, celery, carrots and garlic in large 5-quart Dutch oven in a couple of tablespoons of olive oil. 2. Add lentils, water, and remaining ingredients. Bring to a boil. Reduce heat to low. Simmer until done. Remove ham bone and let cool. Remove meat and add to soup. Discard bay leaf before serving. This makes a huge amount. Lots of delicious leftovers. Watch the liquid. 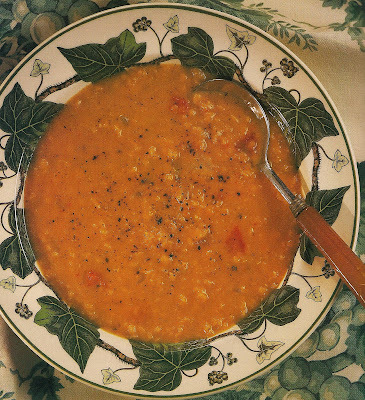 You may have to add more depending upon how soupy you like your soup! Also, I don’t salt or pepper. The ham bone usually adds enough seasoning. Misty is our wonderful hostess for Camera Critters. Be sure to go and visit. the beautiful and shy Okapi. The okapi (pronounced oh-COP-ee) is an unusual animal. With its white-and-black striped hindquarters and front legs, it looks like it must be related to zebras! But take a look at an okapi’s head and you’ll notice a resemblance to giraffes. The okapi is indeed the only living relative of the giraffe. Like giraffes, okapis have very large, upright ears, which catch even slight sounds, helping them to avoid trouble. They also have long, dark prehensile tongues, just like a giraffe’s, to help them strip the buds and young leaves from the understory brush of their rain forest home. Okapis are hard to find in the wild. Their natural habitat is the Ituri Forest, a dense rain forest in central Africa (northeast region of Democratic Republic of Congo - formerly Zaire). Okapis are very wary, and their highly developed hearing alerts them to run when they hear humans in the distance. In fact, while natives of the Ituri Forest knew of okapis and would occasionally catch one in their pit traps, scientists did not know of the animal until 1900. The secretive nature of okapis and the difficulty most humans have of traveling in their habitat have made okapis hard to observe in the wild. Therefore, researchers can only estimate how many okapis live there. It is believed that there are currently about 25,000 okapis in the wild. The okapi’s dark purplish or reddish brown fur feels like velvet. It’s also oily, so water slides right off, keeping the okapi dry on rainy days. Only the males have horns, which are covered by skin and are short so they won’t get tangled in forest branches. The changing politics of central Africa and the continued loss of habitat threaten the beautiful okapi. Fortunately, in 1952, one-fifth of okapi habitat in Africa’s Ituri Forest was set aside as a wildlife reserve. The Okapi Wildlife Reserve, with support from zoos and conservation organizations, and the local people, continues to protect and to support study of this rare and unusual forest dweller. The lovely postmistress, Marie, is our hostess for Postcard Friendship Friday. Marie has had an interest in Arkansas lately. I didn't have a card from Arkansas so I visited the New York Public Library again for the postcard below. I like trains! 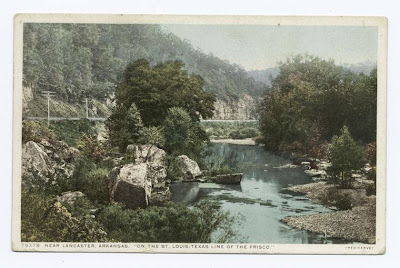 "Near Lancaster Arkansas on the St. Louis - Texas Line of the Frisco" Fred Harvey"
I love calendars. I seem to have one in every room. I guess I need lots of help knowing what day of the week it is! Most come from organizations I belong to -- a thank you for a donation and, of course, wanting another. Then there are the few that I am fascinated by in some way -- beautiful photos, wonderful words. This is the one that has gotten my attention and seems to want to teach me something. 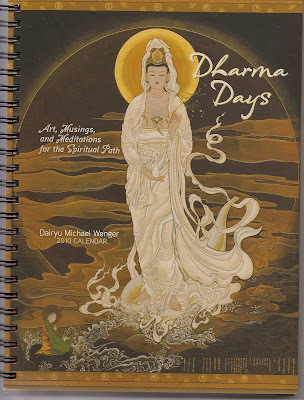 It is an engagement calendar designed to bring the wisdom and vitality of the Buddha's teachings into everyday life. The theme of this year's calendar is kindness and compassion, which are fundamental expressions of a Buddhist way of life. Each month begins with a teaching, a poem, or a Zen story and suggests practices to manifest the teaching. 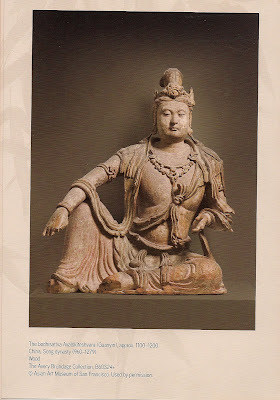 The teaching for the month of January was a celebration of the bodhisattva Never Despise, who appears in chapter 20 of the Lotus Sutra. This remarkable being does not criticize anyone. He/she realizes that everyone will be a Buddha one day. Well, easier said than done! I was warned by the calendar that I shouldn't be discouraged doing this practice. That it is difficult and if I could do it for a short time I might feel an incredible buoyancy and if I found myself judging, not to add a criticism on top of a criticism! Wow! I found myself getting irritated with a checkout clerk at the grocery ... not paying attention to what she was doing with my stuff and talking to a customer in another line. I didn't say anything out loud, and finally, when I was outside the building, I started laughing and found myself saying over and over -- don't be critical!!!!!! And, I laughed out loud some more. I don't know if laughing and buoyancy are the same thing -- but it sure took the sting out of my irritation. Another reason why I'm enjoying this calendar -- the beautiful art work! I wonder what the lesson for February will be? 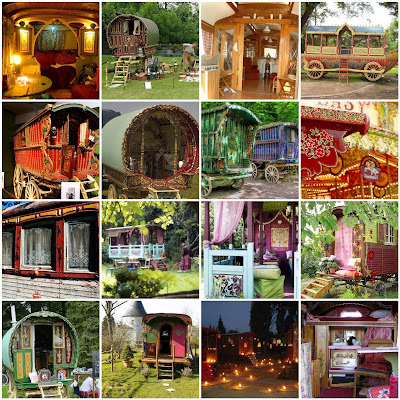 and get those gypsy caravans moving. We have a magic carpet or two to find. Today is the day that One World One Heart 2010 begins! Edited 2/15/2010! We have a winner by the random number generator number 136, Susan Scraps! Congratulations, Susan and please email me with all your information! Thanks! I had so much fun last year visiting new to me blogs, meeting new bloggers, making new friends, finding that kindred spirit. That's what One World One Heart is all about and a BIG THANK YOU to the wonderful Lisa for being our hostess for this event. Be sure to visit A Whimsical Bohemian to visit other participants. Collage Creations: 20 Projects for Embellishing Everyday Objects by Kim Ballor, Barbara Matthiessen and Tracia Williams; Artists Journaling and Sketchbooks: Exploring and Creating Personal Pages by Lynne Perrella; and a light weight shawl. The shawl is knitted with a crochet border in Homespun by Lion Brand yarns, perfect to cuddle up with as you travel on your magic carpet (or gypsy caravan). The winner will be chosen by random number generator on February 15th and announced the same day. In order to be that winner, be sure you leave a comment on this post. You must have a blog and I must be able to reach you if you are the winner! Have a wonderful time on your journey! We love eggplant. Eggplant everything/anything. But we especially love eggplant parmesan. For us it is comfort food. It can be quite a production to make. I found a great recipe in America's Test Kitchen: Cooking for Two 2009. This recipe scales back the work required and does it all in one skillet. For the two of us, I try to find a nice small eggplant that I cut in 1/4 inch crosswise slices - fitting easily into the skillet. 3. Place the eggplant slices in the bag of flour, shake the bag to coat the eggplant, then remove the eggplant from the bag and shake off the excess flour. Using tongs, coat the floured eggplant with the egg mixture, allowing the excess to drip off. Coat the eggplant with the bread crumbs, pressing on the crumbs to help them adhere. Lay the breaded slices on a wire rack set over a baking sheet. 4. Heat the oil in a 12-inch ovensafe nonstick skillet over medium-high heat until simmering. Add half the breaded slices to the skillet and cook until well browned on both sides, about 4 minutes, flipping halfway through cooking. 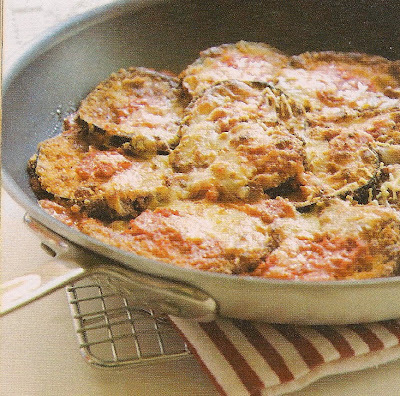 Transfer the cooked eggplant to a wire rack and repeat with remaining breaded eggplant. 5. Pour out the oil and wipe the skillet with a wad of paper towels. Spread 1 cup of the tomato sauce over the bottom of the skillet. Layer the eggplant slices evenly into the skillet, overlapping them slightly. Dollop (I pour pasta sauce until I'm happy) the remaining 1/2 cup sauce onto eggplant and sprinkle with remaining 1/4 cup Parmesan and mozzarella, leaving the outer 1 inch of the eggplant slices clean. 6. Transfer the skillet to the oven and bake until bubbling and the cheese is browned, 13 to 15 minutes. Let the eggplant cool for 5 minutes, then sprinkle with the basil (if using) and serve. I know this sounds like a lot of work, but it's worth it! I've made this recipe so many times, that I know how much flour, bread crumbs, eggs to use for the slices of eggplant that I have. We get two meals from this recipe (along with a nice side salad). I hope you enjoy it as much as we do. We enjoyed the eggplant parmesan today. Mr. Dragon has completed his six weeks of pre-op chemotherapy and radiation therapy. He had a rough stretch that we now think was caused by a stomach virus. Now we work on building him back up -- working on stamina -- for the surgery (early March). Once again, thanks to all of you for your good wishes, prayers, vibes, juju, white light, etc. We appreciate it and it works! Misty is the hostess for Camera Critters. Be sure you drop by to visit. A couple of shots of a ring tailed lemur at the Houston Zoo. Lemurs are primates found only on the African island of Madagascar and some tiny neighboring islands. Madagascar is home to many amazing animals found nowhere else on Earth. The Ring-tailed lemur, Lemur catta, is one of twenty-two species of lemurs. They share a common ancestry with Africa's monkeys and apes, but were isolated from those species probably 50 million years ago when Madagascar separated from the African continent. Ring-tailed lemurs have powerful scent glands and use their unique odor as a communication tool and even as a kind of weapon. Lemurs mark their territory by scent, serving notice of their presence to all who can smell. During mating season, male lemurs battle for dominance by trying to out stink each other. They cover their long tails with smelly secretions and wave them in the air to determine which animal is more powerful. Our wonderful postmistress, Marie, is the hostess for Postcard Friendship Friday. Marie posted a wonderful postcard of a little girl with a pig. 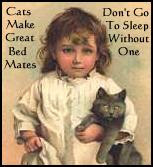 I didn't have a postcard with a pig but I did have one of a little girl and a cat. 30 full color portraits to mail, share, and cherish. Naughty Puss!, 19th century (American). Looks to me like it should be an ad for something like Bactine! Why did it take me so long to finally read a mystery by Peter Lovesey? I keep shaking my head wondering! Now that I've finally picked up a couple to read, I'm hooked. It's a good thing I don't mind reading out of order! I have lots of good reading ahead of me. The first one that I tried was The Secret Hangman: An Inspector Peter Diamond Investigation by Peter Lovesey. I started reading and I didn't want to put it down. It flew. Well written. Charming characters. Wonderful editing. Good story. Lots of red herrings. Wit. Plot twists that will please the most picky mystery reader. Suspense. Condensed from the book flap: "Peter Diamond is being pursued by a secret admirer even as he pursues a serial killer. First, Delia Williams, a waitress with two young daughters, is reported missing by her mother. She is found dead in a park, hanging from the crossbar of a swing set. Looks like a suicide, but it isn't. Other deaths by hanging follow with Mrs. William's ex-husband among the victims. The search for the secret hangman begins." The second Lovesey that I read was The Circle: An Inspector Henrietta Mallin Investigation (with a cameo appearance by Peter Diamond). This one had a different feel to it -- wittier, laid back, but with three murders by fire. Condensed from the book flap: "The members of the literary circle come from all walks of life and practice many forms of writing, from fantasy to torrid romance to household hints. Yet there sems to be nothing about any of them to incite a serial killer. But it becomes clear that there is an arsonist in their midst who is determined to burn his victims to death. Detective Chief Inspector Hen (Henrietta) Mallin is in charge of the investigation of the Chichester murders by fire." Getting to know the members of the literary circle is key to solving the crimes. This is an old-fashioned whodunit written with style and deviousness. More red herrings, plot twists, digs at writers of the unpublishable and at publishers. Black humor. Another good one. And, finally, Literary Feasts: Inspired Eating from Classic Fiction by Sean Brand. This is a delightful little book that I think readers and food lovers would enjoy. From the flap: "While Leopold Bloom fortified himself for his rambles through Dublin with a hearty breakfast of grilled kidneys with pepper, thinly sliced bread and butter, and a large pot of tea, James Bond started his days off with a half pint of chilled OJ, three scrambled eggs, two cups of black coffee, and a pack of Chesterfields. The lucky revelers invited to Jay Gatsby's mansion feasted on baked hams, pastry pigs,and turkeys bewitched to dark gold, all washed down with champagne served in glasses the size of finger bowls. And of course P.G. Wodehouse made sure that Bertie Wooster always dined in style." The book is divided into Breakfast, Lunch, Tea, Dinner, Eating Outdoors, Children's Meals, and Special Occasions with visits to literary treats like Dickens, Fielding, Melville, Shakespeare, Austen, Twain, Fitzgerald and others. This is when cooks really cooked. No prepared, in the box foods here! 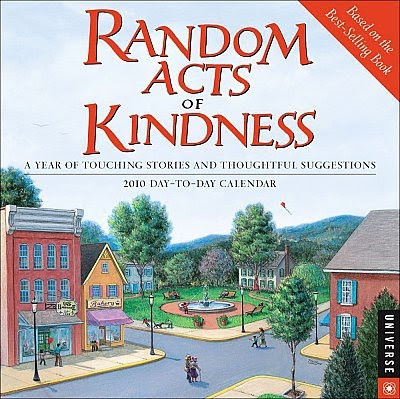 In this wild and crazy world, Random Acts of Kindness happen every day. I'd like to share a few that have drifted our way. I will embarrass these folks by *telling* on them, but that's okay. The universe already knows how wonderful they are and sharing the news with you just seems the right thing to do. 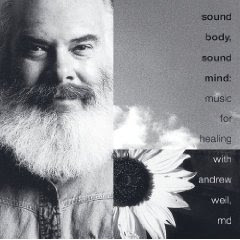 My buddy Kim sent sound body, sound mind: music for healing with andrew weil, md to us. It is beautiful, wonderful, everything advertised and more. What she didn't know is that both of us have an interest in music and acoustics -- Mr. Dragon especially with his physics background. Then there is Corrine, who shares our love of mysteries and is going to make sure we have enough to read by sending us books from one of her favorite authors, Henning Mankell -- an author we haven't read. This is a just a few of my wonderful blogging family that have rallied to the Dragons and the fight we are waging. The blogging family is a wonderful thing. Thank all of you so very much for all your good wishes. Now I'm going to tell you about someone else. Someone who could use a little good cheer right now. This is Gina Drennon and she owns Feather Your Nest, a lovely shop that was her dream. Her husband, Michael, supported her dreams and off she flew until this last week. Michael, age 39, died from a heart attack. Gina has decided to close Feather Your Nest. She needs to find a job with benefits to support her children. Everything in the shop is 25% off. If you can help, please drop by. I wanted to share this Daily OM with you today. It speaks to what is happening in my life. I am so very grateful to my friends who have offered their support. Mr. Dragon has had a rough week with long days, but he is doing much better now. It was so nice to come home today to the wonderful smells coming from the kitchen -- two meals awaited us -- one in the refrigerator and one in a slow cooker. We'll be eating well for the rest of the week and the weekend. Be willing to say HELP. Be willing to rely on others and be sure to thank them. Gratitude-- a wonderful feeling. The first step is accepting the situation fully as it is. Too often we make things worse either by trying to do more than we should or by lapsing into feelings of uselessness. In both cases we run the risk of actually prolonging our dependency. In addition, we miss a valuable opportunity to practice acceptance and humility. The ego resists what is, so when we move into acceptance we move into the deeper realm of the soul. In needing others and allowing them to help us, we experience the full realization that we are not on our own in the world. While this may bring up feelings of vulnerability, a deep feeling of gratitude may also emerge as we open to the experience of being helped. This realization can enable us to be wiser in our service of others when we are called upon to help. From one extreme to another -- a book I really enjoyed and a series mystery I won't read again. So where to start? How about with the one series I'm finished with? I enjoy brain candy - cozy mysteries written around subjects I'm interested in like needlework. I hadn't read a Monica Ferris mystery in awhile (having forgotten why I gave them up once before). When I saw Thai Die, I was intrigued -- by the cover and the subject -- Thailand. This is number 12 in the needlework series by Ferris and that is probably the problem. By the time you get to number 12 there just isn't anything new. The characters that I enjoyed in the past were even blah. The editing was horrible and I just plain didn't enjoy this read that took me one day. At least, I spent only one day. Now Dark Fire: A Matthew Shardlake Mystery by C.J. Sansom is a completely different matter. This historical mystery, set in 1540 was superb, beautiful prose, excellent editing (nothing jumped out at me), an interesting story with interesting characters. YeeeeeeHaaaaaw! A real winner. So good, in fact, that I ordered the others in the series. Mr. Dragon enjoyed it so much, he is currently reading Sansom's stand alone about Spain. From the back cover: "In 1540 Henry VIII has been on the throne for thirty-one years. Lawyer Matthew Shardlake has been called to help a young girl accused of murder who refuses to speak in her own defense even when threatened with torture. On the verge of losing his case, Shardlake is suddenly granted a reprieve. His benefactor is Thomas Cromwell, the kings' feared vicar general, who offers him two more weeks to investigate further. In exchange, Shardlake must find a lost cache of "Dark Fire", an ancient weapon of mass destruction. What ensues is a page-turning adventure filled with period detail and wonderful characters." This book won the CWA Ellis Peters Historical Dagger Award for good reason! Make sure you drop by to visit. I call this series Teddy and his favorite things! Teddy drinking from his favorite faucet. Teddy with his favorite staff. Just a little more to the right, please. Be sure you go by to visit. 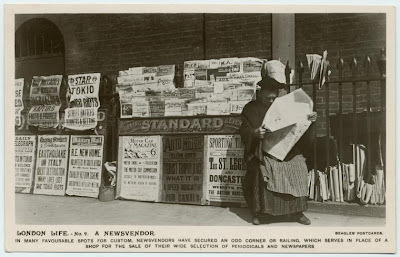 In Many Favourable Spots For Custom, Newsvendors Have Secured An Odd Corner Or Railing, Which Serves In Place Of A Shop For The Sale Of Their Wide Selection of Periodicals And Newspapers"
I just LOVE Mail Call! This week, the book I won over at the Craftside Blog's Holiday Goodness Giveaway arrived. 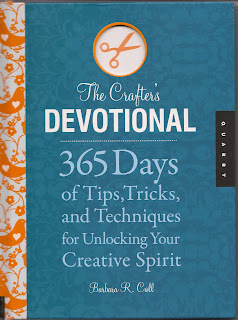 I won The Crafter's Devotional by Barbara R. Call and I'm thrilled! I want to thank all the wonderful folks at Craftside (Lindsey, this means you) for their generosity. 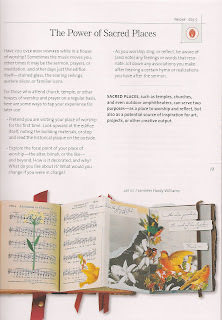 From the back of the book: " Crafters dabble, collaborate, muse, and make, all in their own way on their own timeline. For all crafts, there are established techniques ... and innumerable ways to experiment. No matter your craft of choice, you'll find daily inspiration in the pages of this book. Author and crafter Barbara R. Call understands there is something elemental shared among artists and crafters, regardless of their chosen medium: creative energy. For each crafter looking to hone a favorite skill, there is a dozen who are waiting for that certain spark of inspiration or sinuous root of an idea to take hold. The Crafter's Devotional uses interdisplinary exercises, nuggets of wisdom, brainstorming triggers, and how-to techniques to inspire, enhance, and motivate you to create." I'm going to have lots of good reading, inspiration and fun ahead! Genteel Your Cup of Tea? Is genteel your cup of tea? Then you'd probably enjoy novels by Georgette Heyer. Heyer wrote over fifty novels, including Regency romances, mysteries and historical fiction. She was known as the Queen of Regency romance, and was legendary for her research, historical accuracy and her extraordinary plots and characterizations. She also had a wry and well-developed sense of humor. Her books are being reissued. Spending so much time at M. D. Anderson, we are getting a lot of reading done. The Talisman Ring was the first Heyer that I read. "When spirited Eustacie stumbles into a band of smugglers, she is delighted to be having an adventure at last. Their leader, young heir Ludovic Lavenham, is in hiding falsely accused of murder. Pursued by the law, Eustacie and Ludovic find refuge at an unassuming country inn. And the delightfully sensible couple who try to keep them out of trouble -- the resourceful Miss Sarah Thane and the clear-thinking Sir Tristram Shield, gamely endeavor to prevent Ludovic's arrest and Eustacie's ruin as the four conspire to recover the missing talisman ring that will clear Ludovic's name." Totally entertaining in a very *old-fashioned* way -- "a story in the manner of Jane Austen, of domestic comedy and love affairs." Why Shoot a Butler is one of Heyer's detective novels. Her barrister husband, Ronald Rougier, provided many of the plots for her detective novels, which are classic English country-house mysteries reminiscent of Agatha Christie. "On a dark night, along a lonely country road, barrister Frank Amberley stops to help a young lady in distress and discovers a sports car with a corpse behind the wheel. The girl protests her innocence, and Amberley believes her - at least until he gets drawn into the mystery and the clues incriminating Shirley Brown begin to add up." "In an English country-house murder mystery with a twist, it's the butler who's the victim, every clue complicates the puzzle, and the bumbling police are well-meaning but completely baffled. Fortunately in ferreting out a desperate killer, amateur sleuth Amberley is as brilliant as he is arrogant, but this time he's not sure he wants to know the truth." I read 108 pages of Why Shoot a Butler and wondered why I was continuing to read. And then, suddenly, on page 109 -- the book took off and was a race to the end. I guess it just took 108 pages to get all the characters and background in place! I have a couple of Blog Shout Outs for you. First, visit with Calamity Kim. She is celebrating the Twelve Days of Christmas with a crafty pattern a day. Fun! I also found, thanks to Calamity Kim, Freebies for Crafters -- a blog full of free craft patterns and blog links. That should keep you crafters busy for awhile! 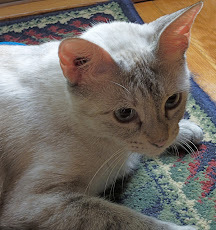 A big THANK YOU to all of you who are sending good thoughts, prayers, vibes, juju et al, to Mr. Dragon. We spend every day at M. D. Anderson, some days much longer than others, and I'm happy to report that he is handling his chemo and radiation very well. Thank you for your emails, telephone calls. Know we appreciate all of you. I don't have much computer time (or crafty time) right now, but try to at least check in with all of you and read what you are up to. I may not comment, but I've been by to visit. 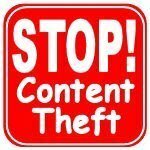 Keep blogging. I love visiting! It is fun therapy for me! crystal drops that will be carried away on the first morning breeze." Camera Critters Happy New Year! A Happy New Year to all my Camera Critters friends. 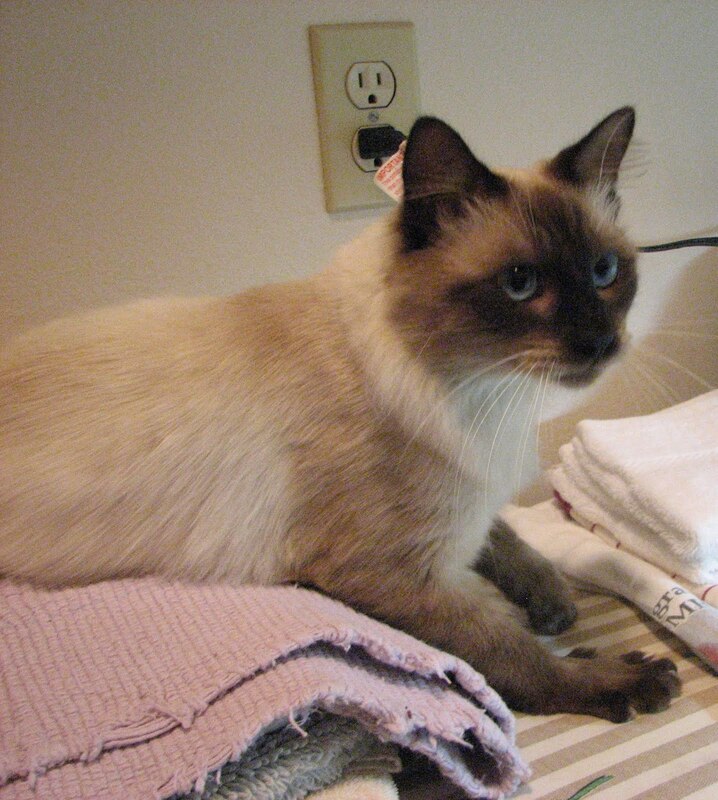 The wonderful Misty brings Camera Critters to us each week. feeding the giraffes at the Houston zoo -- mainly Myles. and Myles didn't want him to stop. one of his *spots* is heart shaped. We'll always know which giraffe is Myles -- look for the heart! Happy New Year and PFF! 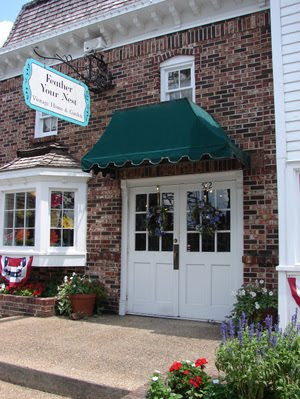 Be sure to visit with our lovely postmistress, Marie. She makes Postcard Friendship Friday possible!